Outside the assisted-living complex, Penny and Boo act like any dogs their age. Full of energy, 2-year-old Penny bounces around the sidewalk, antics that seem to mildly irritate the more dignified Boo, 7. But when the two dogs head inside with their owners, Lisa Freeman and Debra Gibbs, they are all business. As members of the Tufts Paws for People pet-visitation team, they’re on a mission to deliver the comforting benefits of the human-animal bond. “Oh, you make me feel so young,” one woman coos to Penny. She looks wistful as she tells Freeman, a professor at the Cummings School, about her old dog, which kept her company when her husband was away on business after the couple first married. When she hugs Penny tight, the Corgi nuzzles her face. The soothing presence of an animal also helps people cope with larger tragedy: Paws for People provided pet therapy to hundreds after the Sandy Hook school shootings and the Boston Marathon bombings. More typically, though, the program’s 70 volunteers bring their pets to nursing homes, hospitals, elementary schools and libraries. Now, veterinary school researchers are backing up those observations with research, with the goal of turning anecdotes about pet therapy into evidence of its therapeutic value. The program’s 70 volunteers bring their pets to nursing homes, hospitals, elementary schools and libraries. “We need to ask questions about how pet visitation affects physical and mental health” to understand the benefits and ideal frequency of the visits, says Linder. For starters, Paws for People conducted a study in the Grafton Public Library in 2010 that evaluated the benefits of children reading aloud to dogs. Researchers found that kids who did this improved their reading skills compared with those who read to human volunteers. The group is following up on the initial study with another one at an after-school program in Grafton. More organizations and individuals are offering pet visitation because of increasing demand, says Freeman, J86, V91, N96, but not all programs are equal. A few years after its founding in 2005, Paws for People became the Massachusetts affiliate of the national Pet Partners program, which established the first standards-based visitation program in 1991. Tufts chose to affiliate with Pet Partners because it has the highest standards for handler training. 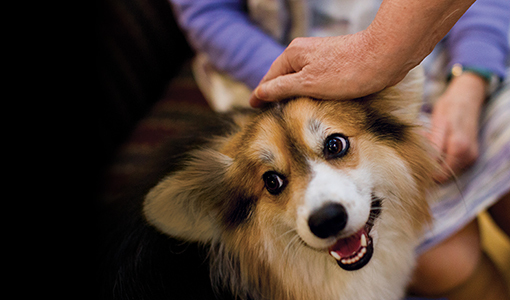 An eight-hour course teaches animal owners how to recognize and handle signs of stress in their pets and the people they are visiting, be they preschoolers or seniors with dementia. Tufts also aligned with Pet Partners because the organization allows animals other than dogs to participate. The Tufts Paws for People teams include two miniature horses, a cat, a rabbit and a guinea pig, in addition to dogs. “We can evaluate any domestic species based on known stress behaviors,” says Debra Gibbs, a veterinary technician at Tufts and coordinator of Paws for People. To volunteer, all owners must bathe their pets within 24 hours of a visit to reduce bacteria and allergen-laden saliva on their coats. Animals cannot be fed a raw-meat diet because of the increased risk of spreading diseases such as salmonella—a policy initiated by Tufts and adopted by the national Pet Partners program in 2010. Sue Marino, who visits with her dog Nemo, understands. It takes her three hours to wash, blow dry and brush the 135-pound Newfoundland’s long coat prior to a visit. “But then you get there, and something happens that makes it all worth it,” she says.